WASHINGTON (CNS) — The famed 500-mile “Camino” trek from southern France to Santiago de Compostela, Spain, takes pilgrims about a month or a bit more, depending on the pace, the pilgrim’s fitness, any hurts sustained along the way, sightseeing and the like. 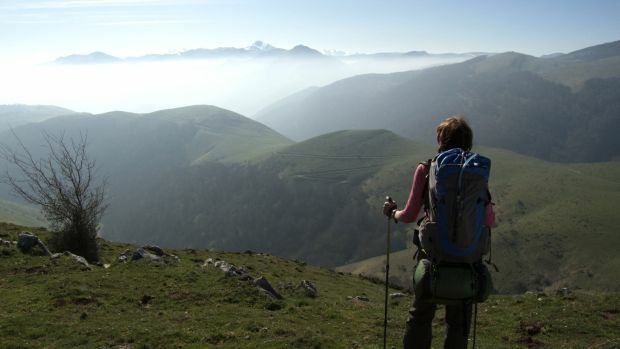 But bringing a film about the Camino to viewers took filmmaker Lydia Smith five years. She thought she had a deal with PBS to air her film in late 2011, but that would have required $85,000 in what Smith called “airing fees” that she didn’t have. As it is, Smith rented a bus that’s taken her from coast to coast, starting in Portland, Oregon, and working its way east. Her hope is to raise enough money in each city she stops along the way to pay for the costs of screening a film in the next city on the itinerary. In New York City, it’s going to cost $9,000 to rent one screen for one week to show “Walking the Camino” when it debuts June 6. Smith, in a question-and-answer presentation after a May 22 preview in Washington where all three screens at a D.C. Cineplex were showing “Walking the Camino,” said she had walked the Camino herself in 2008. When she went back a year later, she filmed a large number of pilgrims making the trek. “some of them you love, some of them not so much. But when you see them in Santiago at the end, you love them again,” Smith said. She filmed more wayfarers than the 84-minute documentary could accommodate, and would otherwise have been on the cutting-room floor. But in today’s media environment “now they’re called the bonus pilgrims,” Smith said, referring to a separate DVD she offers for sale with walkers and images not in the movie. When Smith “made the Camino,” in the parlance of those who have gone on the journey, she did so as a pilgrim, not as an advance scout for making a documentary sometime in the future. In fact, she added, she resisted that idea. “It was so sacred to me,” she said. It turned out that when she was convinced to make the movie, she found out someone else was making his own film about the Camino: Emilio Estevez, directing his father, Martin Sheen, in the feature film “The Way,” which was released in 2011. “We were both looking for financing,” Smith said. “They got the funding. I didn’t.” Smith, however, made a stop in Washington in February 2011 as Sheen and Estevez came to Georgetown University for a promotional preview of “The Way.” They were there even in the middle of son and brother Charlie Sheen’s very public split from his television hit “Two and a Half Men” — and pretty much everything else, for that matter. Santiago de Compostela has been a pilgrimage site for the past 1,200 years when what are believed to be the remains of St. James were discovered there. Some go even farther, about 80 miles to an ocean town called Finisterre, which means “end of the earth,” as people in those times believed the world ended at that spot. Smith chose the pilgrims who made the final cut of “Walking the Camino” for their geographic diversity: American, Canadian, Portuguese, French, and a Brazilian-Briton. Though it wasn’t a prerequisite, all finished the journey; about 20 percent of the many thousands who set out each year don’t, according to Smith.